Welcome back to The Naturopathic Kitchen. As always, our focus is to learn more about bringing new, fun, and healthy foods into our home kitchens. Today we will take a closer look at a flavorful favorite, chocolate! Though today most people associate chocolate with candy, desserts, and other sweet treats, this was not always the case. For most of its 4000-year history, chocolate was consumed as a bitter drink. Evidence of ancient civilizations’ use of chocolate has been dated back to 1900BC.1 The Mayans made a concoction that was a combination of crushed cocoa beans, chili peppers, and water. They heated it and then repeatedly poured it from one vessel to another until a layer of frothy foam developed on the top.2 There was no sugar in the region at the time so the concoction was quite bitter. In fact, it is believed that the word chocolate comes from the Mayan word, “xocolatl” which means “bitter water.”2 Chocolate also had other uses in society. For both the Mayans and Aztecs, money really did grow on trees, as both civilizations used cocoa beans as a form of currency.2 It is believed that the famous Aztec King, Montezuma II, drank upwards of 50 cups of chocolate per day! 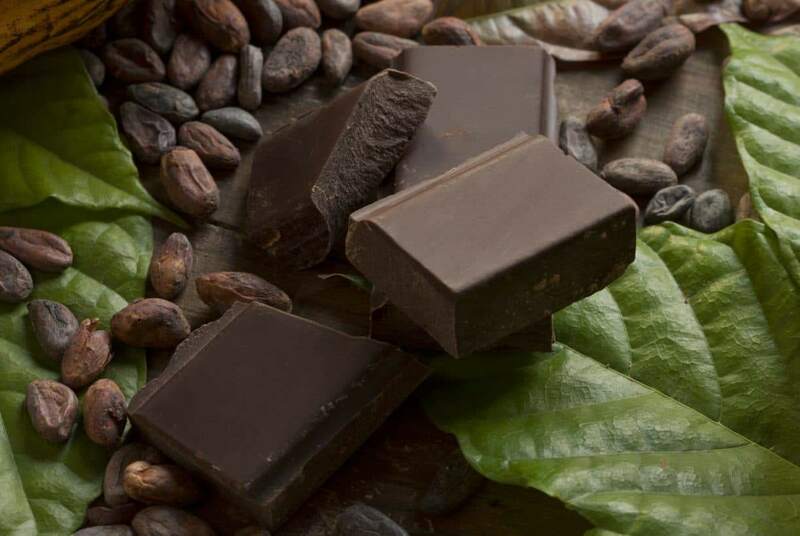 It wasn’t until the 1500s that chocolate made its way to Europe.1 The exact origins of chocolate in Europe are not clear, but it is generally agreed upon that it first appeared in Spain where it quickly became a favorite of the Spanish court. Soon, other European countries such as France and Italy were importing chocolate. The Europeans began combining chocolate with sugar, spices, and other flavorings, and soon trendy chocolate houses began popping up in major European cities as a place for the wealthy to indulge. Today, chocolate is enjoyed by people of all socioeconomic levels, mostly as sweet confections rather than in liquid form. Although some famous chocolatiers maintain a commitment to ingredient purity, in most cases, modern chocolate is highly refined and mass produced. A staggering 90% of the world’s cocoa supply is grown on family farms by about six million farmers who support their families by growing and selling cocoa beans.3 The work is hard and they are often paid very little for their efforts. Some estimate that 40% of cocoa is slave grown.4 With demand for cocoa rising and prices of cocoa beans falling, the owners of cocoa farms struggle to meet the demands of production. Some have turned to low-wage and even slave labor, sometimes involving child slaves acquired through human trafficking, as a means of meeting demands and staying competitive. As such, the standards of fair trade chocolate were developed. Cocoa products that are “fair trade” bear a label marking them as such. This means that certain criteria such as non-use of GMO plants or harmful agrochemicals, submitting to and passing regular inspections, and guaranteed payment of a fair wage for their products have been met.5 Being paid a fair wage means that farmers can avoid cost cutting practices that undermine the quality of the product and negatively impact the lives of laborers as well as lead to destruction of the environment. Where does chocolate come from? Where can I find it? Chocolate is available everywhere, but it is important to seek out chocolate that is produced under fair trade standards. Fair trade cocoa is typically shade grown and organic. Fair trade cocoa products can often be found in traditional supermarkets but health food stores are also an excellent resource. Baking Chocolate: Baking chocolate is also known as “bitter” or “unsweetened” chocolate. It looks and smells like chocolate but has a bitter taste if eaten on its own. It provides a rich chocolate flavor in baked goods where it’s bitterness can be countered with the addition of sugar. Dark Chocolate: Dark chocolate contains between 30-90% cocoa solids. It is a combination of sugar, cocoa butter, chocolate liquor, and an emulsifier like lecithin. Semi-sweet and bittersweet also fall into this category. Sweet Dark Chocolate: Sweet dark chocolate is technically classified as “dark chocolate” because it does not contain milk solids, but it does have a higher percentage of sugar and in some cases only 20-40% cocoa solids. Semi-sweet Chocolate: Originally popularized in reference to branded semi-sweet chocolate chips, semi-sweet chocolate is a term mainly used in America. Bittersweet Chocolate: Bittersweet chocolate typically contains 50-80% chocolate liquor. It should have a deeper and more bitter flavor than sweet dark or semi-sweet. Milk Chocolate: Milk chocolate not only contains cocoa butter and chocolate liquor; it also contains some type of milk in the form of condensed milk or dry milk solids. Milk chocolates are often much sweeter than dark chocolate, lighter in color and have a more mild chocolate flavor. White Chocolate: White chocolate contains only cocoa butter with no chocolate liquor or any other cocoa products. By law it must contain at least 20% cocoa butter as well as at least 14% milk solids, and no more than 55% sugar. It does not have any characteristic chocolate flavor. There are products available that use vegetable fat instead of cocoa butter. These products are technically not “white chocolate” at all and should be avoided. How does chocolate help my health? What medical conditions/symptoms is chocolate good for? When should chocolate be avoided? Aside from an outright allergy to chocolate, chocolate can be enjoyed in moderation by everyone- except your dog. Chocolate contains a compound called theobromine that is highly toxic to dogs because their physiologic mechanisms for breaking down theobromine work very slowly allowing it to build to toxic levels in their system. Theobromine toxicity can result in muscle tremors, seizures, irregular heart rate, internal bleeding and heart attacks. Among the initial symptoms is severe hyperactivity. Let’s try out chocolate with these delicious and nutritious recipes! Arrange cauliflower in a single layer on a baking sheet. Brush both sides with 2 tablespoons of olive oil and season with salt and pepper; broil, flipping once, until charred and tender, about 15 minutes. Meanwhile, heat remaining olive oil and the garlic in a 12″ skillet over medium. Cook until garlic is golden, 4–6 minutes; transfer to a bowl and let cool. Wipe skillet clean and heat olive oil over medium-high; fry peppers until blistered and slightly crisp, 4–6 minutes. Transfer peppers to paper towels to drain; season with salt. Stir almonds, 1 cup parsley, the chocolate, sherry, salt, and pepper into reserved garlic oil; spread onto a serving platter. Top with cauliflower; garnish with fried peppers and remaining parsley. A special thank you to Saveur.com for the amazing recipe! In a food processor or blender, combine the avocado, egg, vanilla, and sugar. Blend until the avocado chunks are smooth. Stir in the salt, baking soda, flour, and cocoa. Add in the mini chocolate chips. Lightly grease a cookie sheet and drop rounded tablespoons of cookie dough onto the sheet. They won’t spread much so you don’t need much room in between. Remove from the oven and let them cool for a few minutes before removing from the pan. Thank you to IHeartVegetables for this wonderful recipe! Receive information from the accredited schools of your choice located across North America! Never miss our latest news, resources, and event invites. Perfect for prospective students, current students, and professionals in the naturopathic field.